Ever since DJ Hero, I've been obsessed with mashups. Mashups are when you take two songs and mix them together to create one new song. Maybe it's because I grew up during the '80s but my favorite mashup from DJ Hero 1 is Ice Ice Baby vs. U Can't Touch This. Some other notable tracks on my mashup playlist are Beachball Sky Falls Down by Myon and Shane 54 and Every Car You Chase by Party Ben. Anyways, aside from the serious digression, the whole point of me telling you all this is to relate it to April's building contest: The Hybridfighter Contest. Basically, your task is to make a mashup ship using two ships from the Star Wars Universe. - Build an entirely new starship or vehicle utilizing design elements from two different starships or vehicles. - You may draw inspiration from any ship or vehicle that LEGO has made into an official set to date, be it canon or expanded universe. - DO NOT take chunks of two official LEGO sets and attach them together. You will be laughed at and then disqualified. - Your hybridfighter must be in minifig scale. - You may optionally include a pilot minifigure. 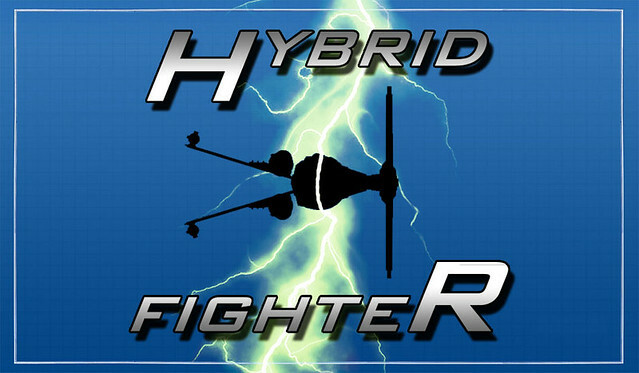 - Submit one or two photos of your hybridfighter as a reply to this post. - Contest deadline is 11:59pm GMT -8 (Pacific Time) May 7, 2011. There will be one round of voting. This is a winner take all contest. He who has the best hybridfighter determined by his peers shall receive one copy each of two of the ugliest sets currently available: 7930 Bounty Hunter Assault Gunship and 7931 T-6 Jedi Shuttle, because within their ugliness, there lies beauty in free LEGO. If you have any questions about these rules, please post. No modified parts or stickers. Simply post a photo of your model in a reply to this thread before the deadline. If it didn't work, send a PM to Solo. Photography note: be sure to submit the best picture possible. Color and contrast correction is recommended if necessary. The only other image enhancement allowed is replacing the background with either a solid color or simple gradient. Your photo cannot be altered in any other way. For example; no composite views, special effects, text, graphics, or scenery will be permitted. Remember, the contest is about the models - not your image manipulation prowess. Clarifications from page 1: All Star Wars vehicles that have been made by Lego (walkers, speeders, starships, etc - no playsets), from any faction (Republic, CIS, Rebels, Empire, etc - mix and match at will), are allowed as inspiration for your mashup (pick only two though) - but the end result must be a starfighter. Clarifications from page 2: No transition/evolution models where you make a new ship inspired by two others - use recognizable parts from two (and only two) ships and as much scrap as needed to merge them into something that flies. Alternate color schemes are OK. Custom pilots are OK (again official unmodified parts only though). Vehicles from official sets only are allowed for your source pair, alt models do not count as official models and are not allowed. Clarifications from page 3: For Fett's sake people, official designs are not allowed in your model. For futher explanation and examples, see here. Beautifully simplified: "Take 2 ships that have had official models made of them. Ignore the official LEGO models. Make 1 ship using partially recognizable elements of both ships without stealing any design elements from the official models" (care of MisterFubar). Also, you aren't limited to a single pilot. Clarifications from page 4: Droids (full or partial) are also allowed even if neither of the source ships had one. Last edited by Solo on Thu Apr 14, 2011 10:24 am, edited 4 times in total. Great contest and one I might actually enter if I have the time. I've always been a huge fan of "uglies"
Now let the silly questions about rules and the building begin. I am entering, but first I need to get some ideas. Great contest and thank you for it FBTB. yeah !! a challenge for April ...thanks guys for it ! To clarify, is this for starfighters, or any ship from the Star Wars universe? "- You may draw inspiration from any ship or vehicle that LEGO has made into an official set to date, be it canon or expanded universe." So, go on, make that Republic Gunspeeder Bikeship* or whatever other crazy combination you can mash up. *I claim first rights on this exact name. Oh im pumped for this one! Gotta crack my knuckles and give it hell! the rules wrote: Basically, your task is to make a mashup ship using two ships from the Star Wars Universe. While I love the idea of a space train with s-foils on it, we're sticking to the Star Wars universe this time. GIR3691 wrote: To clarify, is this for starfighters, or any ship from the Star Wars universe? Any vehicle can be used for your source vehicles. Walkers, Speeders, Starfighters, the works. But the end result must be a starfighter. Now before some nerf herder asks, the Death Star is no vehicle. It's a space station. Also it's way too big to incorporate into anything like this so don't bother trying to get technical. Remember: minifig scale. Okay, here's a (probably stupid) question: can we combine sides? IE: Alliance vehicle with Empire, CIS with Republic? I'm guessing we can, but I thought I'd ask before I start building. Thanks! 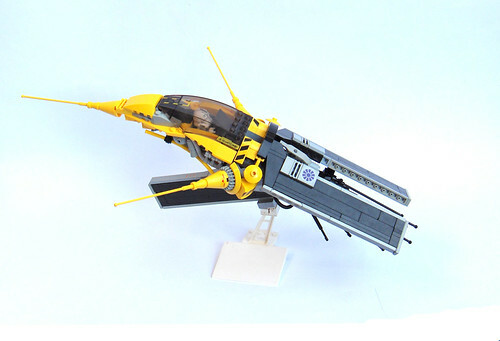 Okay here's another (probaby stupid) question: the rules say starfighter/vehicle, but is there a size restriction? I understand the Death Star comment, but, say I combine an AT-AT with an X-wing (which I call claim on), would that be considered too large, since it would probably be considered a transport not a fighter? No sanctioned size restriction, just keep it reasonable. Remember that Starfighters are typically crewed by one and highly maneuverable. You won't get disqualified for making a bad starfighter, but you may be if you make no effort to present it as one. Chopping the legs off an ATAT and slapping on some dinky s-foils won't cut it. Using the head as a cockpit on the other hand... I can see someone pulling that idea off. Actually, I was gonna build a full-size AT from scratch and add X-wing wings and have the legs fold up in "flight mode" but I'll think of something else. Can we combine more than two vehicles? 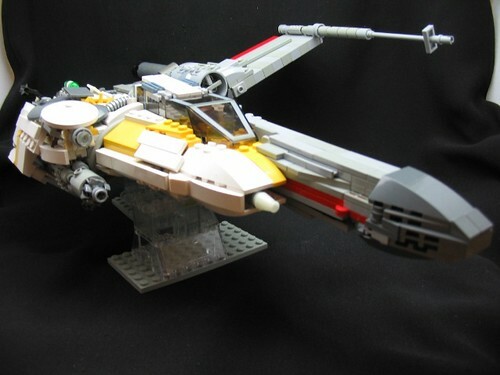 Question here, suppose I wanted to make one with a Y-Wing cockpit, would I be allowed to use the one from the actual set or would I have to build it with a diferent design? 2) If that's the case, is building a new "transition" type model an automatically DQ'ed entry, or just an entry that steps away from the original spirit of the contest (but might still be awesome)? Boyfromvalley wrote: Question here, suppose I wanted to make one with a Y-Wing cockpit, would I be allowed to use the one from the actual set or would I have to build it with a diferent design? From The Rules wrote: - DO NOT take chunks of two official LEGO sets and attach them together. You will be laughed at and then disqualified.